The works which the Father hath given me to finish, the same works that I do, bear witness of me, that the Father hath sent me.” John 5:36. “The signs of the times fulfilling all around us show us that the end of all things is at hand. Intense earnestness should take possession of us. Our slumbering energies should be aroused by persevering effort. During one of the evening Bible studies. We decided to take the commission of our Savior seriously to help souls turn from darkness to light and help more churches to be established. We chose Techimantia as an out-of-the-way place where a weak church has been for about 30 years now. It is approximately two hours’ drive from the city of Kumasi. This town has been dominated by a church called True Faith Tabernacle Church that has been able to raise three different temples in various areas of the township for worship. It is a Sabbath-keeping church but knows nothing about the Three Angels’ Messages and true Sabbath observance. They observe the Sabbath from 6:00 am to 3:00 pm. Therefore, we gathered our efforts together and immediately set preparation underway to present the truth to those dear souls who have no knowledge about the present truth. 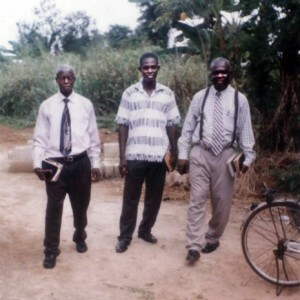 Pastor Kusi Amoakohene with two fellow, self-sacrificing workers conduct house-to-house visits. However, we had to embark on some effective house-to-house work to soften the ground almost two weeks before the opening night. Wemet interested people during the visitation. The house-to-house work yielded fruitful results, and on the opening night a very large audience was gathered at the meeting site to hear the message by Pastor Kusi Amoakohene entitled “The Result Of Sin.” On the second day, close to our preaching grounds, a church called The Blood of Jesus Ministry came and mounted a platform for their one-week outdoor program. We talked to them about the clash of programs, pleading with them to postpone theirs until after ours had been completed, but their “prophet” told me that they take instructions from the Holy Spirit and not man. Do you know what the Lord did? Through prayers, God wonderfully directed a great number of people to come to our site to hear His Word. By the use of the computer and projector as well as the chain of lessons which were shown on the screen, many were attracted to the scene. We bought pens and notebooks for those who were anxious to copy the quotations that we wrote on the board. 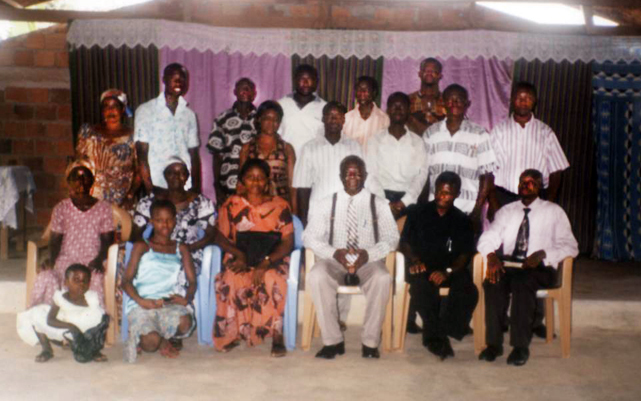 Group picture with attendees of the first Sabbath worship. Some were able to stand on their feet while others sat on the verandas of nearby houses. When the change of the Sabbath and the antichrist were covered with pictures of the type of beast, they were taken by surprise; they had not seen any such pictures on these topics or heard these facts from the Bible before. We were surprised because, from experience, whenever we presented these topics, the number of hearers usually decreased; but to the contrary, the number increased as so many of them were excited to know about the prophecies. During the altar calls, as many as 23 people surrendered to Christ by coming forward. National Sunday Law and Behold He Cometh were distributed to many of them who could read. Unfortunately, there was a blackout which destroyed the program twice, and there was no power generator to rent in the town. We therefore traveled about an hour’s drive to rent one to make the program successful. Pastor Kusi Amoakohene with Brother Seth and his father. When the Sabbath message was given, a brother named Seth went home to call his father to come and listen to the message, stressing that this was the church that they needed to attend. Both came to me to write down their names as they had been thirsting for the truth for far too long and that was the day that the Lord had revealed it to them. In fact, during their worship with us on the first Sabbath, they sat down with me after the service and asked questions about the beast and his image. After my explanations, they gave thanks to God for giving them their hearts’ desire. There was a Radio Information Center in the town where some churches go to preach at dawn. We also paid for the cost of preaching through that medium for a week. After we finished our program at the center, the Catholic Youth in the town went to pay for three days of preaching and tried to refute our message that the Pope was the antichrist. So the radio presenter offered free airtime for both we and the Catholic Youth to meet for a debate on the issue. But they failed to come. It is obvious that they have no biblical backing. We give all the glory to God for His leadership in this work. 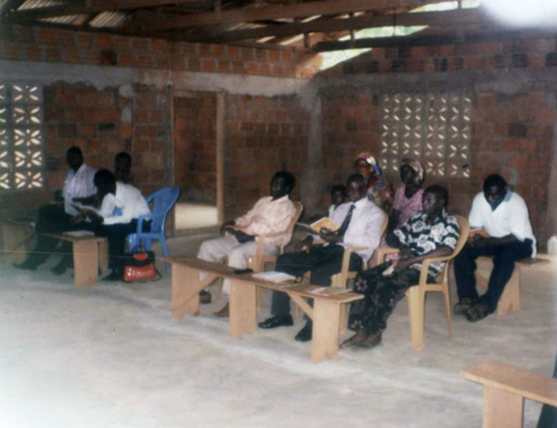 It has resulted in gaining as many as 15 main students with whom we are studying. We need the kind prayers of all believers and readers now as we follow up to help those who are in the valley of decision. It is also my prayer that the Lord would kindly bless me with a power generator and a digital camera to help make the work more successful. Both would cost around $700. By Pastor Kusi Amoakohene. Email: kushene@yaho.co.uk. 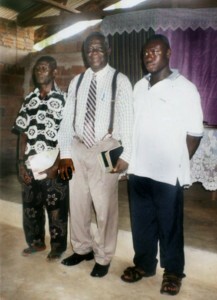 Historic Adventist Church, PO Box 4476, Kumasi, Ghana.